Model management languages such as those provided by Epsilon are by design not general purpose languages. Therefore, there are features that such languages do not support inherently (mainly because such features are typically not needed in the context of model management). However, there are cases where a feature that is not built-in may be necessary for a specific task. To address such issues and enable developers to implement non-standard functionality, Epsilon supports the Tool concept. A tool is a normal Java class that (optionally) conforms to a specific interface (org.eclipse.epsilon.eol.tools.ITool) and which can be instantiated and accessed from the context of an EOL (or any other EOL-based language such as EML, ETL, EVL etc) program. After instantiation, EOL can be used to invoke methods and access properties of the object. In this article we show how to create and declare a new tool (org.eclipse.epsilon.examples.tools.SampleTool), and then use it from an EOL program. 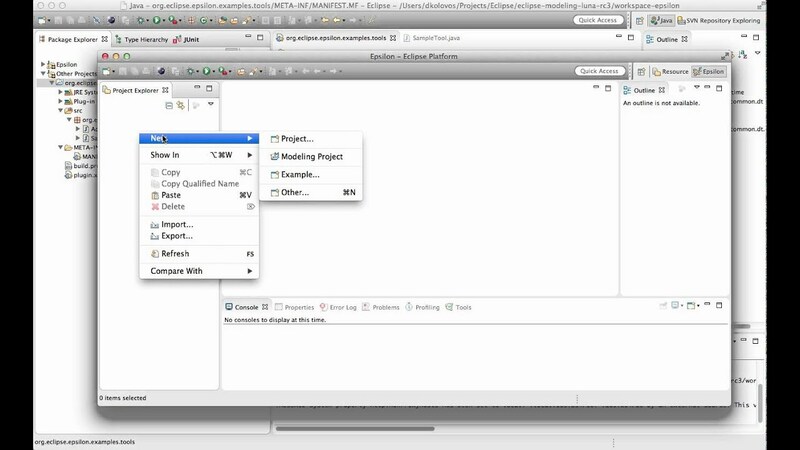 The first step is to create a new plugin project named org.eclipse.epsilon.examples.tools. Then create a class named SampleTool with the following content. To invoke the tool you have two options: You can either run a new Eclipse instance, or export the plugin and place it in the dropins folder of your installation. Then you can invoke the tool using the following EOL program. To use tools contributed via extensions in a standalone Java setup within Eclipse you'll need to add the following line of code. You can get the source code of this example here.